Stoke-on-Trent in Staffordshire, England is known as the Potteries, and with its rich supply of clay perfect for potting found in the area, plus coal that could fire the kilns, it also gained the accolade of being known as the World Capital of Ceramics. Stoke’s life with pottery as their primary business began around the 17th century. It was here in 1750 that spongeware (or spatterware as it’s also known) really originated. The spongeware movement really gained momentum when the famous Wedgwood factory opened its doors in the area nine years later and created spongeware pieces from 1800 – 1820. What Is Spongeware and What Was It Used For? Traditionally spongeware was created on earthenware, which is defined as "some of the earliest clays used by potters, which is highly plastic, easily worked and containing iron and other mineral impurities." Earthenware is usually fired at a lower temperature than stoneware, roughly 1745°F and 2012°F (950°C and 1100°C). The earthenware provided a great base for the decorative spongeware to adhere to. Spongeware pieces are typically very functional, often things like mugs, bowls, vases and pitchers for use in the kitchen. For this reason, many pieces were made in molds. 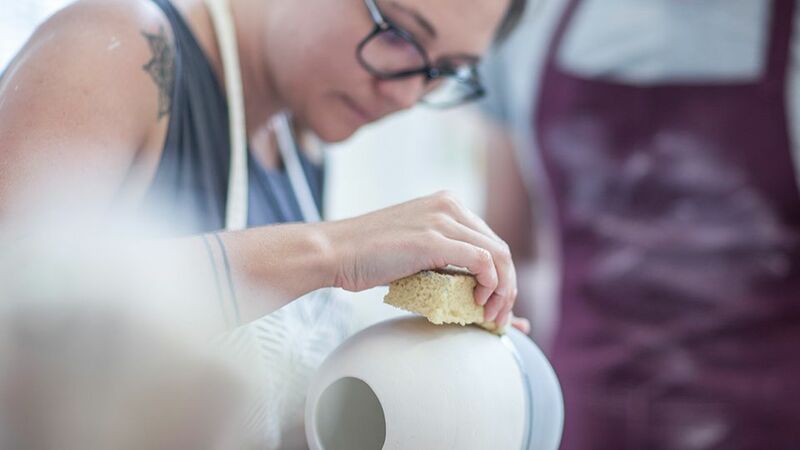 Once the piece was ready, a glaze was then applied to the surface piece in sporadic or in a deliberate fashion, dependent on what look the potter was going for. Is There a Difference Between Spongeware and Spatterware? Although the terms spongeware and spatterware are used interchangeably, they are actually quite different techniques. Spongeware was applied as the name suggests, using one (or a variety of) cut sponges to carefully apply the glaze onto the ware. This technique could be very precise as the glaze was essentially stamped onto the ceramics. Occasionally a rag was used to apply the glaze. Spatterware was a little more random in its application, in that the glazes (very traditionally it was a "cobalt oxide mixed with liquefied clay") were blown onto the ware using a pipe. One of the joys of that comes from both of these techniques of glaze application is that each piece is completely unique and cannot ever be replicated exactly. What Types of Glazes Were Used in Spongeware? In some of the earliest spongeware pieces that have been found, a cobalt oxide was used as a glaze. Cobalt oxide has been defined as the "most powerful coloring oxide, producing a deep blue or black color." Spongeware was typified by having a "solid primary color glaze." Following this use of brilliant bright hue, potters began to use different colors and there have been huge amounts of brown pieces of spongeware that have been discovered throughout history. Blues and brown were the most popular colors found for spatterware, but with modern spongeware and spatterware, there is no limit to what can be created. Spongeware has been a popular technique since its inception, but there were times when it needed a bit of a shakeup, as there were some periods where the designs looked a little more drab than exciting. After all, spongeware was well-known for being one of the cheapest potteries you could buy. In the UK, spongeware's shake-up comes in the form of the fantastic British potter, Emma Bridgewater. Her influence on spongeware was so huge, it could be said that she was responsible for the revival of spongeware. She started her company, Emma Bridgewater, in 1985, realizing the gap in the market for relaxed, colorful pottery, and so began experimenting with the old technique of spongeware. They still manufacture their ceramics in a very manual and traditional way using hand-cut sponges, all applied by hand. Emma Bridgewater’s work is the perfect modern day example of the beauty and simplicity of the technique of spongeware.